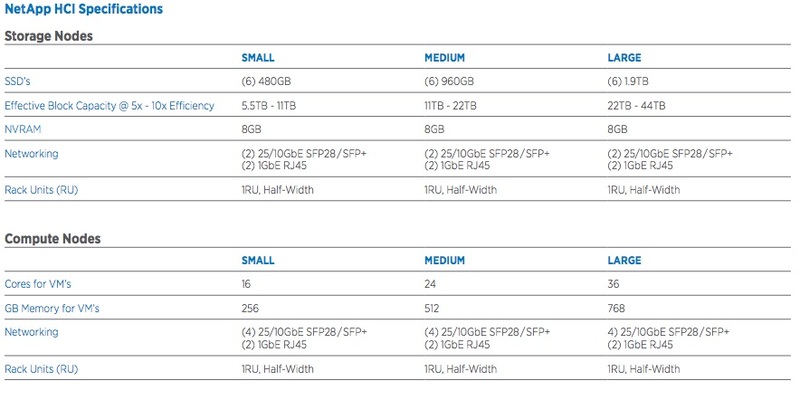 NetApp has finally revealed its long-promised hyperconverged appliance. Named “NetApp HCI”, the product pours almost everything the company does into a 2U box, along with four unnamed servers, a cloud-style pay-as-you-go pricing plan and a vCenter plugin so you can manage it without having to learn new tools. The house of the big blue staple has long believed that its software collection is hard to beat when organisations want to move beyond the grubby work of managing arrays and stride into the bold world of innovating with data that lives on disparate boxen but is bound together in a data fabric. Buying SolidFire enhanced that story by giving NetApp not just the decent all-flash array it had previously struggled to build, but all-flash arrays that scale well. The company's core software portfolio and SolidFire are therefore at the heart of its NetApp HCI. The latter will be in harness with a new cut of ONTAP Select that is now better at managing storage in remote offices, or melding data stored in places as disparate as VSANs, physical arrays, IBM Bluemix, commodity servers and NetApp HCI. There's also a new cut of OnCommand Insight that can optimise storage, forecast demand and advise on costs across multiple platforms. These hybrid cloud features are deliberate because NetApp thinks other hyperconverged vendors can't match its cross-platform data management capabilities, so it's making them the star of its appliances. It also thinks SolidFire gives it a scaling story rivals will struggle to match, not least because its appliances can scale compute and storage independently. The company also has a quality-of-service play that allows resources to be allocated to applications as needed without creating noisy neighbour problems. The appliances are a vSphere-only affair for now and while there's a “NetApp deployment engine” we're told allows you to set up server, compute and the VMware environment, NetApp has also built a vCenter plugin and expects you'll manage the devices through VMware's control panels. The boxes themselves come in S, M and L sizes, with versions dedicated to storage and compute. NetApp tells us they were designed to its specs, but declined to name the manufacturer or the boxes' specifications. We therefore don't know what silicon will be aboard, but do know the appliances will come in the following configurations. NetApp's going to try to convince the world that its hyperconverged rivals are playing with forces they barely understand, cobbling together nice-looking but ultimately fragile rigs. The company will emphasise its pedigree as a long-time enterprise player that's been there, done that, and has a well-worn arse groove on plenty of chairs in meeting rooms next to CIOs' offices. It will also earnestly state that it's nailed the integration of its products and imbibed cloud wisdom to the extent that the new appliances will be sold on a pay-as-you-go model that lets customers spend only operational funds rather than rightly-hoarded capital. But the company also knows it has work to do to make this all work. Sales teams are being trained to sell servers and appliances and NetApp's channel are being revved up. Part of that work will be managing suspense because the products are promised for “Fall 2017” - northern Autumn. Which could mean 90 or 180 days from now. The Register knows the hyperconverged market will move fast between now and then. We understand Nutanix will get busy in early July. HPE has only just started its work with SimpliVity. VMware won't be idle and will soon have real bits of its own cross-cloud offering in market, perhaps enough to represent an alternative to NetApp's hybridised Data Fabric. At the very least, all will be able to chip away at the things NetApp says makes its HCI distinct – before it comes to market.